Move over kale smoothies and spinach salads. 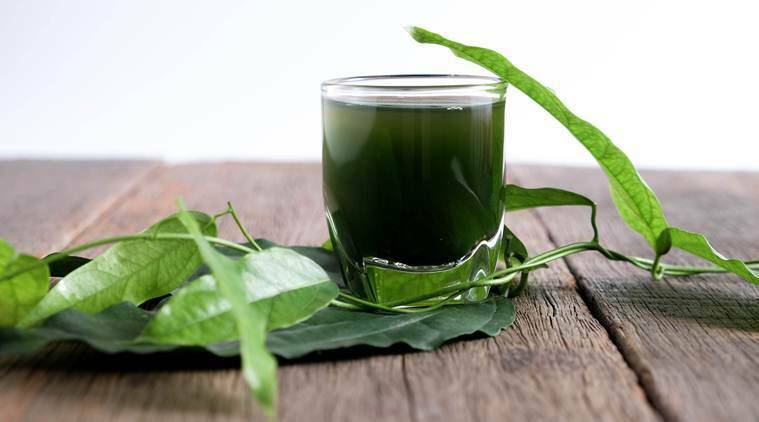 From what it looks like, liquid chlorophyll is the latest fad and it is here to stay. Known to lend green colour to plants and help in converting sunlight into energy in plants, chlorophyll is now the trendiest supplement available in the market that promises to house a number of benefits — right from detoxing the body to getting a clearer skin. Famous Hollywood A-listers like Hannah Bronfman and Jennifer Lawrence swear by its benefits and include it in their daily diet. Not limiting itself to supplement stores, many cocktail and beauty or detox drinks have started adding a dash of it to their concoctions. Green-emerald in colour and easy to incorporate into one’s diet, here are some benefits of chlorophyll water. According to a report, “a 2004 study showed that wheatgrass, which is made up of 70 percent of chlorophyll, reduced the number of blood transfusions required by patients of thalassemia”. A glass of chlorophyll water of just a few drops of it added to your smoothie or soup can detoxify your body and rid it off any toxic metals or chemicals. By cleansing your system, chlorophyll water, that is rich in antioxidants and several essential micro-nutrients can put that glow back on your skin. In case you’re running late or do not have perfume on you, you can use chlorophyll water to get rid of the stench. The most recent study of people with trimethylaminuria, a condition that causes fishy odours, found that chlorophyllin significantly decreased the amount of trimethylamines.